Film makers are compulsive collectors. 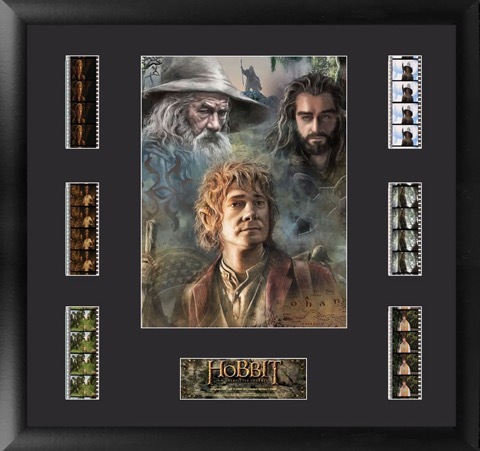 Here is the latest addition to my collection, a mounted display of film cells from the Hobbit. Film cells have long been a sought after by film enthusiasts. There is something magical about owning an actual piece of the celluloid of a favourite film. A section of the original 70mm print of Lawrence of Arabia is amongst my most treasured pieces of movie memorabilia. But there is an irony concerning my latest acquisition - the Hobbit was shot digitally and so celluloid has only been used in cinemas which have yet to convert to digital projection. Music lovers often talk of the near religious experience of taking an LP out of its sleeve and putting the vinyl disk on the turntable of a gramophone. This experience can never be equalled by putting a CD in a player. There is a parallel with the dedicated film enthusiast, who has celluloid in their veins. To the film lover, the act of lacing up a projector is also akin to a religious experience, which can never be replaced by putting a memory card into a digital projector. 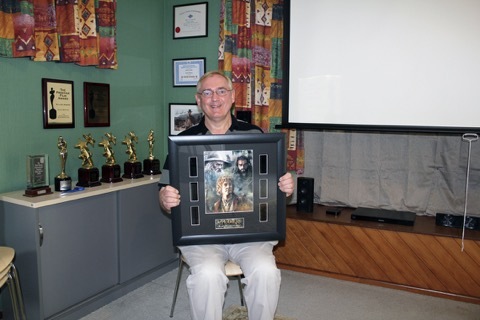 Digital cinema certainly provides huge opportunities for indy film makers, but perhaps we need to look for a new focal point for our memorabilia collections in the digital age!